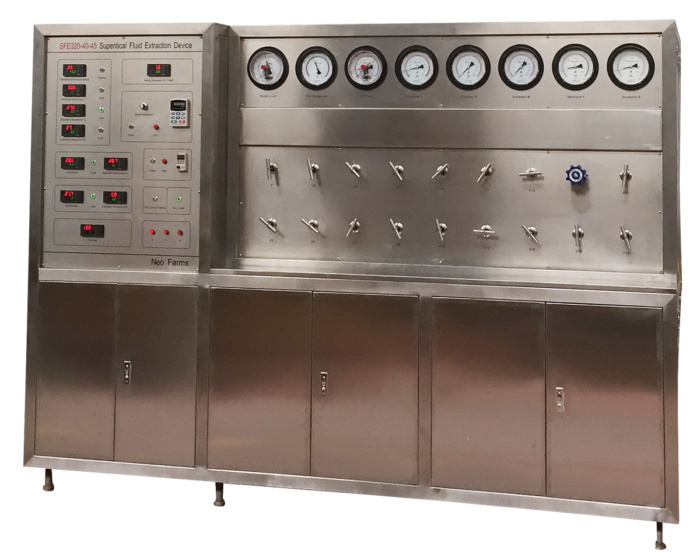 The 30L system offers small pilot plant scale, while still maintaining quick extraction cycles, quietness and minimal maintenance. 1.1 This system is a multi-function SCFE equipment, the working mode is intermittent or continuous to extract from solid or liquid material, there is also a cosolvent pump. 1.2 The system has three extraction vessels and two separators, using automatic pressure adjustment and automatic hydraulic quick-open structure design. 1.4 The pressure vessels are designed to ASME and each includes multiple pressure protection valves on each pressure vessel. This piece of equipment is a beauty, has multiple safety features and easy operation. We use only top of the line quality materials, which extend to an easy care and long lasting machine. Pressure temperature flow number can be seen from pressure meter and digital instrument, making for double accuracy when in operation. Material of pipe parts, valves, and pipe lines are all 304 stainless steel. (1) The pressure pump has limited pressure structure, you can set it among the range of working pressure, and stop the pump when pressure is complete. Automatic pressure adjustments for your custom settings. (2) Each extractor, separator, evaporator, dry purifier and mixer have safety valves for over pressurazation. (3) Anti-exploder: using explosion piece to protect, precision no more than 5%, and co2 is stored as liquid in co2 storage tank and mixer. The electricity lifter which can move left to right, up and down on top side of extractor, it can be used to lift material tanks up and down, while reducing operator work. Safety training of the equipment is included by video or available to be onsite: power, pressure, inflammable and explosive, mechanical drive, health, operations, mantaince and so on. k) CO2 storage tank: Air cooling, volume 24L, Max working pressure 2320 PSI (16MPa), with jacket and coiler double chill design.